Most healthcare providers are aware that referrals are critical, high-quality, and high-value demand generation channel. Did you know? But there are some mistakes every provider makes which can affect the revenue and the referral process to a great extent. These confusions cause a bitter experience to the referring physicians. The chances of PCPs referring to such specialists are less. This will lead to the failure of the referral program. 2. Complicated referral process – A referral program should not impede the existing workflow. It should not require extensive hours for a person or group to manage the referral program. One of the major problems faced by referring physicians is that they have to manage multiple systems or software for initiating a referral. For eg: A referral coordinator must take the patient information from the EMR/EHR and then create a referral through fax, website or direct message. This complicates the process for the referring physicians. 3. Finding the right specialist/imaging center – The number of imaging centers and specialist practices is increasing day-by-day. The referring physician does not have the list of all such imaging centers and specialty practices. The chances of missing out on a good receiving provider are high. With a manual process in place, it takes a lot of time and effort for the referral coordinator to narrow down the referral coordinator’s search and find the right one. 4. Time- consuming referral process – As the referrals are handled manually, a referring coordinator spends about half-an-hour to one-hour for a creating referral on an average and even more time in following up the same. 5. No system to give referral updates – After a referral is sent, both the referring and the receiving providers so not have easy access to updates. The referring and the receiving providers lose track of the referrals as it is difficult to coordinate manually for such referral updates. This results in open referral loops. 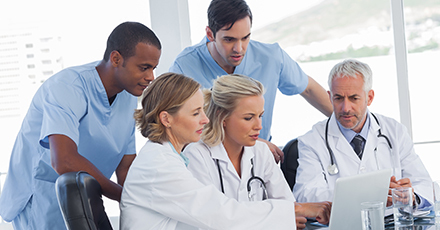 Referring physicians can address the referral workflow challenges and achieve a streamlined referral pipeline with the help of a software solution. HealthViewX Patient Referral Management solution enables creating a referral in three simple steps thus providing a successful referral program. After the referral is created, it can be tracked with help of the status. Both the referring and receiving providers will be notified of the appointments, test results, treatment recommendations, etc. HealthViewX can integrate with EMR/EHR and can also coordinate between the referring and the receiving sides. Any referral has a timeline view which is common to both the receiving and the referring providers. In the timeline view, history of the referral can be seen for eg: notes related to the patient’s health, previous status of the referral, etc. Documents attachment and status change can also be done at any time of the referral process. HealthViewX Patient Referral Management solution can always keep you updated on the progress of the referral thus simplifying the referral process and helps in closing the referral loop. HealthViewX Patient Referral Management solution helps the referring provider to track the referral progress. Schedule a demo with us and our patient referral management experts will guide you through our HIPAA compliant solution. How has HealthViewX added value to referring physicians’ patient referral problems? It simplifies the process of insurance pre-authorization. The referral coordinator need not waste time on the process anymore. Our “Smart Search” feature makes it easy for the referring provider in finding the right provider. It has smart filters and search options that help in narrowing down the specialist based on the requirements. As a result, we can cut down on miscommunications and bridge the gaps between the specialist and the physician community. The system also assembles a patient encounter record from the EMR/EHR and pushes it directly to the physician. Our system helps in strengthening ties with the medical community. From a history referral experiences the PCPs can from a close-knit of referral receiving providers. Physicians can refer now patients to hospitals they can rely on. HealthViewX Patient Referral Management solution helps the referring physicians in handling and managing their referrals. Are you an inbound referral heavy practice looking for an end-to-end referral management solution? Schedule a demo with us. Our patient referral management experts will guide you through our HIPAA compliant solution. Referring physicians can address the referral workflow challenges and achieve a streamlined referral pipeline with the help of a software solution. HealthViewX Patient Referral Management solution enables creating a referral in three simple steps thus providing a successful referral program. After the referral is created, it can be tracked with help of the status. Both the referring and receiving providers will be notified of the appointments, test results, treatment recommendations, etc. This entry was posted in blog, Referral Management and tagged medical referrals, medicare, physician, referral, referrals on December 5, 2018 by Helena Nancy.